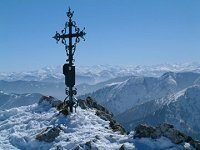 Here you will find some reports from ski areas in Germany, Switzerland, Austria and Italy. Currently this page is under construction. The river through the village as well as the valley has also the same name. The river Lech flows down through Reutte in Triol, Füssen and Augsburg in Germany into the Donau traveling to the Black See. Since Diana, Princess of Wales, visited here for skiing, many skiers form GB are visiting. 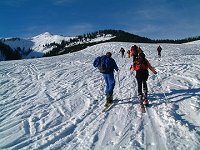 Because you can ski everywhere except for protected forest, and some ungroomed ski routes are available, it is quite attractive for off-piste skiers. Avalanche and other alpine risks have to be taken into account. 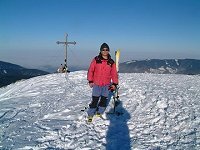 Auerspitz, the neighborhood of the Rodwand, has a wonderful north east slope for moutain skiing. It is easy to reach by a comfortable jeep road to the Rodwandhaus, which is just in the next to Auerspitz. This time I took the route to Soin-Alm and then to Geitau via Klarer-Alm. This route has a steep and narrow hiking route where you had better to put skin on your skis. Or it is better to take a route via Soinsee to Geitau, or to Ursprung valley via Sillberg-Alm. Scharling is located in the south of Tegernsee. 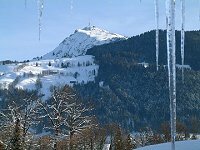 Hirschberg is one of the most popular mountain in the Tegernsee area. Its massive body is recognizable from all over the area. Hirschberg is one of the popular mountain also for light mountain skiing. It was already 9:30. We would have start earlier. Never mind. Let us enjoy only Sunshine today rather than skiing. Feldalphorn belongs to the Kitzbueheler Alps and is located in about 12km south from Woergl. In spite of its constant and gentle slope, it provides of an amazing panorama view from the top. This route has no difficult terrain and is suitable also for beginners. 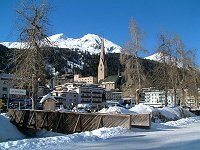 A small village of ski resort and the world economy forum Davos is located in the south east of Switzerland, Kanton Graubuenden. It is surrounded by many skiing areas. Davos is not a typical simple village but somehow sophisticated. Of course everything is expensive. 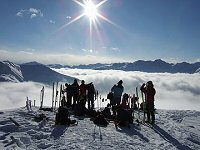 Hochplatte (1813m) in Achen valley is one of the beginner mountain for tour skiing.. It did now snow much still now and the terrain was enough hard to climb up easier. Hakkoda is one of the most popular mountain ski area at the north end of the main island of Japan. Because of its unbelievable amount of snow in winter, the old rest snow is still available even at the middle of May. 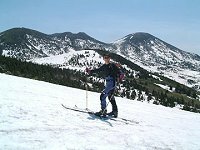 In such late season, skiing here is more comfortable by the long day time and higher temperature. 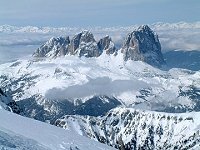 Still one large area in Dolomite was open issue; Sella Ronda, a round trip with ski around Sella group, one of the most famous ski area in south Tirol Italy. Even after the World War I, German is still spoken there. This may also one reason, why so many German skiers are visiting there. 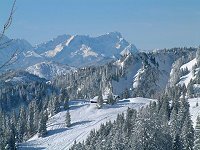 Kitzbuehel is one of the famous ski resort in Tirol, known with its world cup downhill racing. It is not so far from Munich, so it is also possible to go there in a weekend. That was a first day when I could use new currency EUR, the second of January 2001. The first thing to pay for was the ski pass! Achenkirch is one of the nearest Austrian Ski area from Munich. Hintertux is a village located at the end of Tuxer valley, jointing to Zillertal (Ziller valley) from west. On the south west side of the village, a large glacier area can always be seen; Tuxer glacier, where you can enjoy summer skiing. It takes about 2.5 hours from Munich to reach the village. 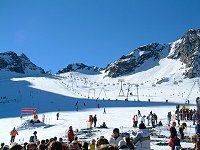 Stubai glacier is also not far from Munich. For the people in Innsbruck it is almost a short drive. For a good start of the season, Keiko (my ski coach) took me to a ski training in early November. The nearest ski area from Munich is Brauneck, also called by a name of the village Lenggries. Once it snows much in winter, Brauneck becomes also an interesting ski area. Train, bus and lift combi-ticket from Munich is also available.